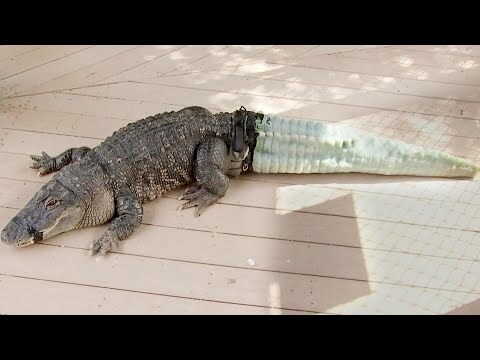 Experts say the tail of an alligator named Mr. Stubbs’ was probably bitten off by another gator and has left him at quite a disadvantage. But thanks to a team of researchers and doctors, he now has a chance! “If he is in a pen with other alligators he can’t move as quickly, so they get to the food first,” Midwestern University associate professor Dr. Justin Georgi said. Experts say the prosthetic will take some time to get used to. InsideEdition.com’s Keleigh Nealon (http://twitter.com/KeleighNealon) has more.